We welcome any questions or concerns you may have regarding your project and equipment rental questions. 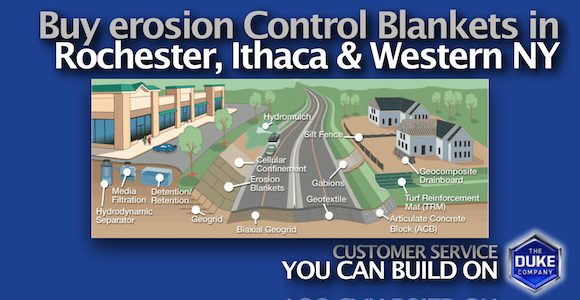 For example, we recently received a question via our quick quote portal regarding the Erosion Control Blankets. We were happy to accommodate her project needs. Call the Duke Company for all your construction equipment needs – including a wide variety of construction equipment rentals including Hanes Geo Erosion Control Blankets and Matts. Erosion control blankets and mats are essential for proper erosion control and to protect your job site against rainfall and fun-off. Biodegradable, and available in rolls, Hanes Geo Erosion Control blankets are highly engineered to diminish the loss of seeds, dirt, vegetation and landscaping. In selecting Erosion Control Blankets and Mats, be sure to ask the Duke Company’s building product experts about which Hanes Geo product is best suited for your application with respect to your grade requirements, thread type, flow velocity and flow depth. TerraGuard DC Double Net .64 Lbs. 2 Ch. TerraGuard DSC Double Net .6 Lbs. 2 Ch. TerraGuard DS .5 Lbs. 2 Ch. TerraGuard SS .5 Lbs. 1 Ch. TerraGuard DC Double Net Coconut erosion control blankets are the top end of professional requirements and capable of handling a flow velocity of 12 feet per second, and a flow depth of 6 inches. TerraGuard SS erosion control blankets are designed for less severe conditions and are capable of handling a flow velocity of 6 feet per second, and a flow depth of 4 inches.